Tackk, the best way I know of to create one-page websites, has emerged from beta full of new features and surprises. It's the same Tackk you know and love (or should, if you don't already), except it's bigger and better. The platform is now easier to use, offers more personalization, and, in keeping up with the times, is also much more social. In a nutshell, you can use Tackk to create good-looking websites for any occasion, as long as you don't need more than one page. You need not a shred of coding skills, and even design skills are almost unnecessary. This does not mean all Tackks look the same, though. Tackk's found the golden way to ensure all pages are beautiful, while giving you just the right amount of decision and personalization options. All embed options are in the same place, and include a contact form, a payment widget, and more. If you've used Tackk before, you won't be disoriented by the new design. Most options remain where they were, with the addition of a more streamlined creation process, taking you through the steps of designing your page. You can now choose from whole color palettes rather than just one base color, and the embedding options for videos and music now support additional services such as Rdio, 8Tracks and TED. One option I found missing is Instagram embeds, which are nowhere to be found in this version. The highlight of the new Tackk, however, is in the social features. Unlike the beta version, which included very basic profile details and no social options to speak of, the new Tackk adds the community to the mix. Your new profile includes a photo, a short bio, and links to your personal website and social accounts. 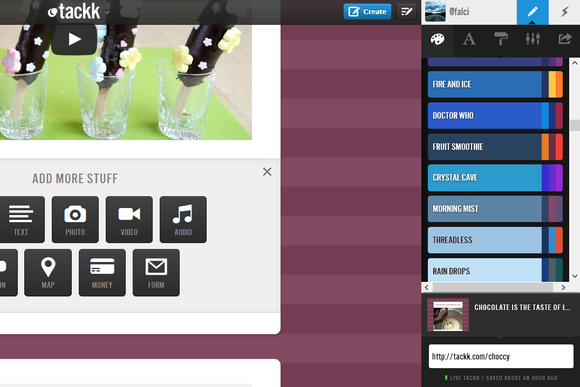 You can follow other users and like their Tackks, as well as share Tackks using a new and improved sharing widget. You will now have a username on Tackk, derived from the email you signed up with, which you can change through the settings if you wish. If you don't like all this social stuff, however, just make your Tackks private and forget about it. The new Tackk profiles are much more elaborate, helping you promote your personal portfolio of Tackks. A new tagging system makes categorizing and finding Tackks much easier. When searching for Tackks in the public Tackkboard, try searching for a tag or multiple tags to zoom into pages you're interested in. Aside from following users, you can also follow tags or combinations of tags, and remain updated on any new Tackks created under these categories. When you search for Tackks, it's easy to find out more about them or share them with one click. No website or service is complete these days without mobile support, and Tackk is no different. 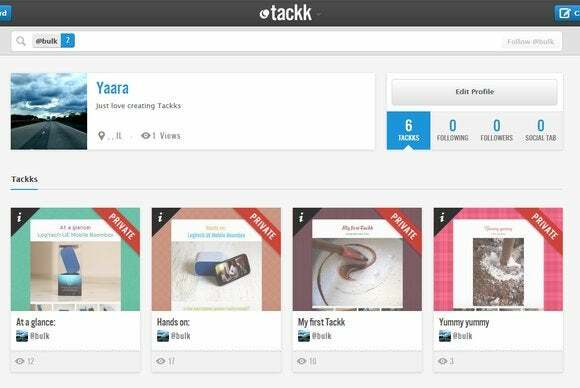 The new Tackk's design is completely responsive, letting you easily browse and create Tackks using your mobile or tablet. Tackk shines on bigger screens, especially when creating pages, but it's nice to have the option to work on your Tackks from anywhere. The new Tackk is still as awesome as always. It's still the best way there is to create single-page website. And now, it's a community too. Hurry up, before everyone hears about it. If you think you can't create your own website, Tackk will help you change your mind.